Golden Robinia are a popular deciduous tree to 25m. With attractiveyellow foliage in spring, Golden Robinia have been used as street trees becuase of the quick growing nature of the species. Mop Top Robinia (robina pseudoacacia) will grow to approx 9m, often used under powerlines. Tolerant of poor soil and reasonably drought tolerant. Root system is vigorous. The Golden Robinia is the tree we see planted in streets across Australia. 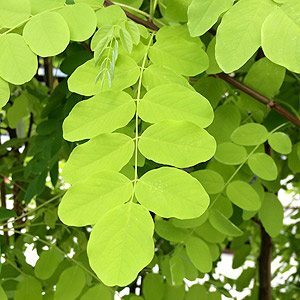 It is a tough deciduous tree that copes well with dry conditions and provides useful shade and also has attractive foliage. Reaching around 10m in height it is fast growing, and has white fragrant flowers in spring, followed by the yellow – green foliage. Look for R. Lace Lady grafted as a standard for a very attractive small feature tree. However Golden Robinia (Robini pseudocacia ‘frisia’) does have its problems, and these are mainly related to suckering. The trees we see are grafted onto a vigorous rootstock which is close to the surface. It is therefore easily disturbed my mowing, digging and by line trimmers. Once disturbed the problem of suckers arises. And as these are from the rootstock they are vigorous and thorny. To avoid this problem, mulch around the tree rather than mow, keep well watered and remove any suckers as the y appear. With golden yellow foliage in spring Robini pseudocacia ‘frisia’ will turn to a lime green by summer.